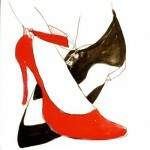 If you are looking to buy tango shoes, we recommend the following local suppliers. The Regent carries a full line of the finest ball room dance shoes. Manufacturers such as Diamante, Werner Kern, and Very Fine Shoes can be purchased from the Regent. Please call the Regent for an appointment. Austin’s specializes in dancewear for ballet, jazz and tap classes. They carry dance sneakers, character shoes, and some ballroom dance shoes which all can be OK for tango. Chicago Dance Supply has a good selection of shoes made especially for tango dancing, particularly women’s shoes.